I was probably singing that song to myself when I drew this misshapen duck. I really like this drawing because it's so awkward and funny. The fart bubble was more accidental than intentional but it seems to suit the duck perfectly. Many of my drawings start with little scribbles that evolve into pictures, which is probably the case with the fart bubble. I really do love ducks and birds in general. 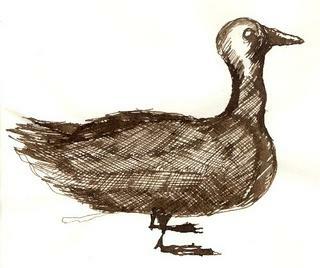 Most of my sketches are imaginary birds, part of a larger project called "The Natural History of the Undescribed Birds". This idea sounds whimsical but it speaks to something more serious - that the natural wild world is being destroyed by humanity faster than humanity can discover and describe it.